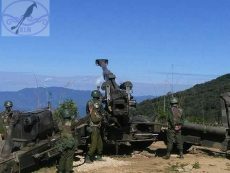 A battle took place between KIA’s 24th Battalion troops and BA troops at a corn field between Ding Ga village and Hka La village in Nmawk township on April 2 at 1:25 pm. Local sources said BA troops are from 426th Light Infantry Regiment led by Lt. Nay Lin Oo. The two sides encountered at the corn field while conducting a regular area patrol.